Quality of facilitators: If previous trainings had good facilitators, we are taking it a notch higher, by bringing the best photographers Nigeria has to offer. The amount of quality for this particular training is one you cannot afford miss out on – internationally recognised Nigerian photographers such as Bayo Omoboriowo, Kola Oshalusi (Insigna Media), Tope Adenola (Horpload works), Yagazie Eguare (GazMadu studios), Tolani Alli (Illusions Imagery), Nmeka That Photographer, and Queen B (Vpcube studios) will be present. You can be sure they will bring their A-game to the classroom. Track record: The Future Enterprise Support Scheme’s track record in training and producing outstanding individuals is second to none. 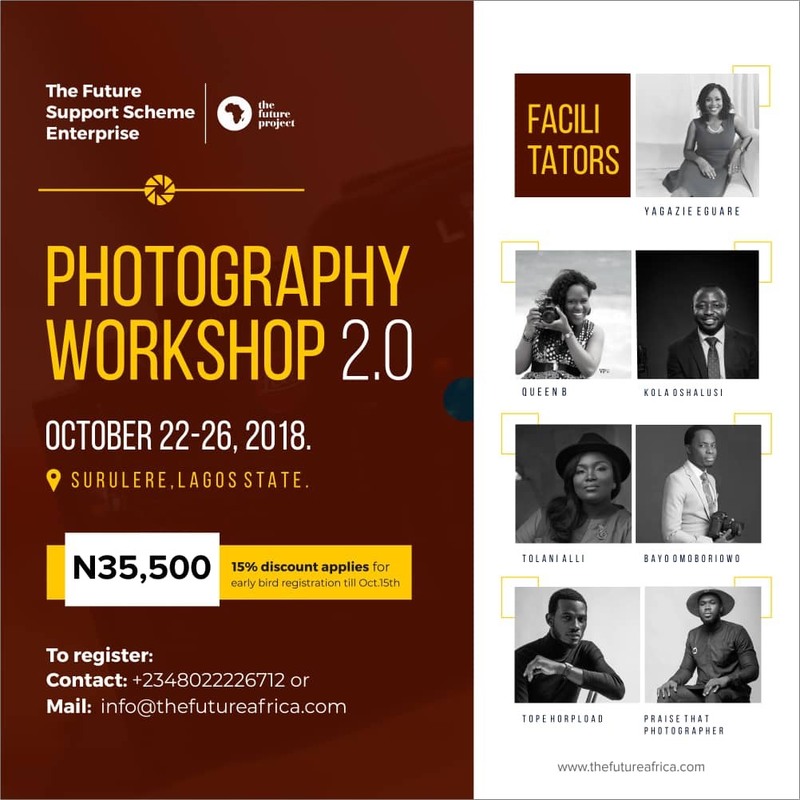 Let me tell you a little secret; President Muhammadu Buhari’s personal photographer, Bayo Omoboriowo, is a product of this training. And guess what, there are many exceptions just like Bayo who have become photo-preneurs and impact makers. This track record of consistently producing outstanding photographers sets TFESS ahead of other photography trainings. Training Method: The track record of TFESS won’t be so impressive if it didn’t have a very effective method of training. The evidence-based method of training is used by TFESS to have maximum impact on trainees. Think about this method as being in a math exam, where you have to rely on formulas to solve your questions, and without the formulas, it will be almost impossible to solve the question. So, think about the TFESS training as a one-fits-all formula where you have to apply lessons learned instantly to solve real-life photography problems. Or how best do you want to resolve lightning issues in your shot without understanding the principles of lightning? Learning the business angle of photography: Photography goes beyond taking shots, making poses, and glitz and glamour. It is also about making a living, which involves understanding the business angles, understanding your audience and niche. TFESS will have facilitators who have mastered the business aspect of photography and are “cashing out” steadily. The curriculum designed for the training is all-encompassing and expected to give participants a comprehensive learning experience. Niche: Whether you want to be a documentary, portrait, wedding, baby, model, fashion or sports photographer, the TFESS training has a lot in stock for you. Not only will you interact with photographers in these niche areas, but you will also get a training tailored to your specific niche. Joining TFESS photography class will be the best decision you would have made this quarter, don’t let this opportunity fade from your grasp. You can still register for the training by sending an email to [email protected] or call +2348022226712. Deadline for registration is October 19, 2018.